I started writing the Carol Childs Mysteries when I was bucked out of my previous life. That’s right, bucked. If I substituted the B in that word for another more suitable letter – namely the letter F – you may have a more accurate description of how I felt. You see after a long career in radio, I had launched The Equestrian News, a southern California newspaper I founded for the horsey-set. At the time, I thought I was literally in my heyday. Pun intended. I was like a little kid at the barn. I was there every day, and when I wasn’t at the stable I was having so much fun writing and reporting on horse shows and the like, that I never dreamed I would one day want to be doing anything else. That is, until the day my horse spooked and my world changed. My bulletproof horse, who I thought would never do such a thing, was frightened by a tractor. No doubt he thought it was a dinosaur, and he took off with me. And when the horse you’re riding is better than seventeen hands I can tell you that’s scary. To make a long story short: He ran. I held on. He stopped. I didn’t. I ended up going over his head and nearly breaking my neck and losing my hand. Fortunately I didn’t, but two surgeries later, and after a year of very painful rehabilitation – not to mention being told by the doc I couldn’t ride again – I found myself staring at a computer keyboard and wondering, so what’s next? Prior to my accident, I had spent nearly twenty-five years working for news and talk radio stations. I had done everything from commercial copywriting to news, and because I was always one of those lean-in type of gals, I retired as the general manager of a sports talk radio station here in Los Angeles. At the time, there were only two female general managers in the market. Some might say it was a feather in my cap. I like to say, it’s proof that God has a sense of humor. So that’s my background. And as I stared at the keyboard, I knew one thing. Writers write what they know and nobody knew the inner workings of a radio station like I did. The stories behind the mic? The personalities? The political workings of a station? I could have fun with that. Plus, I didn’t think it was very likely I’d get bucked off my desk chair, and that had a lot of appeal. What I wanted more than anything was to create a different type of female protagonists, one that was more brain than brawn and who believed a microphone was more powerful than a forty-five. Thus, Carol Childs, a thirty-nine-year-old, single working mother of two, was born. At least on the page, and along with her boss, Tyler Hunt, a twenty-one-year-old whiz kid who considers her the World’s Oldest Cub Reporter, I had a built-in conflict. Something I felt most women could relate to. How about you? What experiences have you had that lead you to where you are today and influenced your writing? Nancy Cole Silverman credits her twenty-five years in news and talk radio for helping her to develop an ear for storytelling. But it wasn’t until 2001 after she retired from news and copywriting that she was able to sit down and write fiction fulltime. Much of what Silverman writes about today she admits is pulled from events that were reported on from inside some of Los Angeles’ busiest newsrooms where she spent the bulk of her career. In the last ten years she has written numerous short stories and novelettes. This entry was posted in Life, Non-Fiction, Writing and tagged Adversity, Author: Nancy Cole Silverman, Autobiography, On Writing on August 6, 2016 by Clayton Bye. Franklin P. Jones, an American businessman during the Roaring Twenties, once wrote that “Honest criticism is hard to take, particularly from a relative, a friend, an acquaintance, or a stranger.” How true, especially for writers who tend to fall in love with their first drafts. But the hardest criticism regarding their work must come from writers themselves. They need to keep in mind that the craft of writing is a process. The first draft is almost never the final draft. In fact, the first draft is not even the first step in the writing process. If you consider your own published pieces, you would admit they enjoyed an editor’s acceptance because you took the time to ready them for publication. Too often writers tend to attribute first drafts to the inspiration of the literary Muse. In their indebtedness to the Muse, they decide not to revise at all. Big mistake! Let’s back up a bit. Let’s begin the writing process at its logical beginning: the planning stage. Nothing is more frustrating than to invest writing time in a short story or article without knowing how it will develop and where it will finally end. Writing is a trip that requires a road map; without one, writers get sidetracked, stories are weakened, and readers are never fooled by any of it. The enthusiasm which motivated writers in the first place tends to dissipate as roadblocks are encountered. What should have been a straightforward, easy-flowing piece, in the absence of a plan, becomes a wheel-spinning exercise in futility. Short stories fare better when writers spend adequate time at the planning stage. A sequence of the story’s major events will keep writers on track. While these steps can be changed, deleted, or expanded, this sequence affords writers a clearer plot path to follow. Another helpful planning device is the observation chart, which invites authors to gather descriptions of characters and settings. Across the top of the chart are the column headings: Sight, Sound, Touch, Smell, and Taste. Down the left side of the chart are the names of characters and places. One of the secrets of good short story writing is providing readers with crystal-clear imagery. If readers can visualize scenes, the written piece is successful. Serious writers wouldn’t be caught dead without a pocket notepad where they constantly jot down ideas, bits of dialogue, phrases, descriptions –– anything that can be helpful. When writers feel confident about the information they’ve gathered, they can study their pre-writing notes, then cull from them some degree of organizational sense to propel them into the next logical step: The First Draft. If you took a survey of writers and asked them which writing step did they find most pleasurable, I would bet most, if not all, would agree it is the first draft. Pre-writing is slow. Sometimes it take weeks, even months, for everything to come together. A jotting of a word here, a question mark there–the brain is working things out. It is assigning organization to what will become compositional piece. Writers have all experienced that surge of creativity as they begin the first draft, which I call “the bridge of sighs” because I know without that first draft I am going nowhere. All those ideas swimming in my head somehow are drawn into a unity that begs recording. While pre-writing is slow, first drafting is frantic. Writers need to get it all down on paper or onto the monitor. As they write, they keep themselves focused on that one objective: to complete the first draft. Nothing else matters except taking the composition from start to finish. In longer works like novels and plays, the focus is the same but on a chapter or a scene of the eventually completed draft. Short stories and poems, on the other hand, can be –– and I believe should be –– written in one sitting! After completing first drafts, writers should put them away for a day or two so that they can return to them with a different eye. I did say writing first drafts is a pleasurable experience. In the act of getting our writing down, we tend to fall in love with what we’ve written. We re-read it and we love it. We might even kid ourselves into believing the first draft can stand on its own without the interference of revision and proofreading. So putting the draft away is akin to putting aside temptation. It doesn’t pay to try and move from creator to critic in one leap. Take a rest. Go read the newspaper. Play “Go Fetch” with your dog. Come back tomorrow or the next day or even next week. When writers do finally come back, they find themselves less attached to the first draft than they were before. Now they can detect a weak beginning, insufficient detail, poorly constructed sentences, empty dialogue, unnecessary or amateurish descriptions, poor choice of words, and a host of other errors that need fixing. Though some writers will insist the pleasure of writing the first draft continues well into the revising stage, I myself do not agree. Admittedly, it is challenging but done properly, it is also hard work. And it takes time and patience to transform the first draft into as perfect a draft as one can make it. During the first drafting, writers create a new reality. They are independent creators who answer only to themselves. Nobody tells the first drafter what to write. There is a delectable sense of freedom at this writing stage. But revising is a different matter. Writers need to add, delete, change and move words, phrases, sentences, and paragraphs, and all the while do so with the reader at their shoulders. Considering those whom you hope will get to read your story, you will improve your chances of getting that story published and widely read. But don’t stop at the revising stage or stop too soon. After you are comfortable with however many revised drafts are necessary, move to the next step in the writing process: proofreading. Nothing annoys an editor more than to receive a well-written manuscript laden with spelling errors, punctuation mistakes, lack of proper capitalization, and even misused verb forms. Does the editor have time to waste proofreading beyond an error or two? I don’t think so. What we send an editor should be neat and without errors. Our submissions need to make a good impression. Proper format rules need to be adhered to or the editor will suspect we are not professional enough for his or her magazine. When you are finally done writing, compare your final draft–that neat piece of work you are sending out–to your first draft. A world of difference, right? Had you made the mistake of stopping with your first draft, you would have added one more “not-ready-to-be-published piece” to your cardboard-box collection. We may fall in love with first drafts, but it’s rarely a love that endures. Like any good relationship, the one which writers enter into with their writings requires time and hard work. Writers will agree it’s worth it all. Salvatore Buttaci is a retired teacher and professor whose work has appeared in The Writer, The New York Times, The Christian Science Monitor,and elsewhere here and abroad. He was the 2007 recipient of the $500 Cyber-wit Poetry Award. He lives with his wife Sharon in West Virginia. This entry was posted in Non-Fiction, Personal Essay, Writing and tagged Author: Sal Buttaci, Good reading, On Writing, Personal Essay, The writing Life, Writing on May 13, 2015 by Clayton Bye. I was once taken to task by a reader for saying that I think a good writer is not only a good liar, but that there is also a bit of larceny in their blood. The young woman in the crowd looked at me as though I had just attacked the Holy Grail. It seems to me, I said, that if cops and robbers are at times only separated by a thin line – that between right and wrong – then certainly mystery writers are only a blank page apart from their characters and the crimes they commit. Pease let me go on record and say that I do not believe all cops and robbers are cut from the same cloth or that writers are all liars, cheats and scoundrels, but that at some point, writers do tell lies, and we all do steal. We have to. We steal from each other – I’m not talking plagiarism – but we are frequently inspired by the ideas of another writer, a conversation overheard at the park, a mother talking to her daughter, two lovers in an argument, or a news story that caught our attention as we had our morning coffee that won’t let go. For instance, this last month I’ve been riveted by the Robert Durst’s story. In case you missed it, it’s the one about the son of a New York real estate mogul accused of murdering his wife, getting a female friend to dress up as her, enter their New York apartment so that she might give the appearance of his wife returning home, then moving to Texas where he changed his identity to that of a mute woman, befriends a neighbor, who he is suspected of convincing to go to California and kill the very woman who supposedly helped him cover up the murder of his wife, and is later accused of murdering the man in self-defense, cutting up the body, and dumping it in the bay. Got that? It’s an amazing story. If I set down to write it I don’t think I could have imagined all the twists and turns. Sometimes you just can’t make this stuff up. Truth is stranger than fiction. While I wasn’t quick enough to grab the idea for myself, writers Marcus Hinckey and Marc Smerling did. They turned it into a successful screenplay, All Good Things, and later worked with HBO to produce a documentary, The Jinx: The Life and Deaths of Robert Durst. After twenty-five years in news and talk radio it’s no surprise that I look to news for the source of my inspirations. For a long time I worked both sides of the desk. In the early days I worked as a reporter, doing light news, when a woman’s voice was a novelty. Later I worked on the business side in sales, marketing and eventually management where women were again a novelty. When I retired I was one of two female general managers in the marketplace. Growing up in the business I saw talk radio as the grand central station of any market it was in. It was the local watering hole where politicians, entertainers, doctors, lawyers, celebrity-chefs and those colorful, local personalities – you name it – came to vent. As for the listeners, the on-air hosts were their friends; faceless voices they listened to each day on their commute to and from work for the latest box score, gossip or crisis update. It’s also where they called to yell at the host and to share their grievances and their victories. For many, talk radio was their commuters’ shrink, their best friend, a faceless voice who would listen and was there for them, twenty-four seven. For me, this theater of the mind – that you could hear but could not see – was rich soil from which to write my new series. 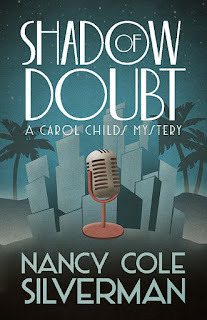 In my first book, Shadow of Doubt, Carol Childs, a middle-aged mom embarking on a new career as a reporter, is told by her friend and next door neighbor that her aunt, a top Hollywood agent has died suspiciously in the bathtub of her Beverly Hills home. Where did the idea come from? A news story of course. The day after an Academy Awards show here in Hollywood, I read an article about a Hollywood Agent who had been shot and killed as she drove home from the awards show. That in itself was terrible, but what followed in the paper was even more intriguing. The agent had twin nieces and had left a will in which one niece inherited one-million dollars and the other niece just one dollar. One dollar! I couldn’t let that pass. The story just wouldn’t let go of me. That’s frequently the way it is. But what came out of the story, for me anyway, was even more revealing. I started to think about Carol and what her own internal struggles might be. Young, single, in the midst of a career change. I looked around at other women, women in the midst of reinventing themselves and the pressures that were on them to succeed. Did I steal from that? You bet. As for my characters Misty Dawn, a former hippy, flower-power clairvoyant who befriends Carol, or Tyler Hunt, her boy-wonder boss, who refers to Carol as the world’s oldest cub reporter, did I make them up? Or were they a combination of the strange but lovable personalities I’ve met along the way? I get asked that a lot but I’ll never tell. However, I will say they all made for a better story because I pulled from those around me and blended fact with fiction. In essence, I lied. A lot. But it all made for Carol’s experiences to ring true on the page. I was very pleased when Kenneth Weene reviewed Shadow of Doubt with great praise. He and other reviewers, who have also liked it, have the set the bar for this new mystery series. And as the sequel, Beyond a Doubt, is about to be released in July, I find myself rubbing my hands, hoping my readers and reviewers will enjoy my second book as much as they did the first. Beyond a Doubt opens with a body dump. Is the idea original? Not entirely. Years ago I woke up to the sounds of helicopters above my house in the hills where I live. Commuters had spotted a body and called police. The story stuck with me, the emotion of seeing a body airlifted from the canyon, not easy to forget. I pulled from all those scenes to get the feelings and emotion I wanted Carol to feel on the page. Am I guilty of theft? Absolutely. My point is that as writers we’re like emotional sponges. We soak in all that we see and hear around us. We have to. To be authentic on the page, one has to be able to recall a similar experience with from within ourselves, or that we’ve experienced vicariously through others. Whether it’s a scene we’re writing or the same gut feeling we need to show our character experiencing we have to pull it from somewhere. To do that a writer must steal from all around him, blur the lines of fact and fiction – lie even – then wrap it up in from of novel or a short story. This entry was posted in Non-Fiction, Personal Essay, Writing and tagged Author: Nancy Cole Silverman, On Writing on April 8, 2015 by Clayton Bye. This is not so simple for a writer. Writers think and create through words, sentences, paragraphs, and so forth. Some create flash fiction, poems, novellas, and novels. Their minds are in a constant state of imagining all sorts of scenarios that might captivate others who read their work. The elusive vacation for an author is a fleeting moment until the stirrings of a plot take hold. Sightseeing is not the same for a writer. Millions of vacationers will look at the same famous monument as the Statue of Liberty. That mighty icon may stir a plot to bloom into the life of a worker who labored long and hard hours laying the stone foundation, maybe losing a friend he worked beside. That friend could hail from the same neighborhood or country— immigrants struggling to make a life in a new world so foreign to them that they now call home. When an author looks at a London skyline, another story is conceived. What were the challenges to the individual citizen as construction took hold? Did an ambitious man see an opportunity to start a business? Did a woman step out of her comfort zone of hearth and home to start a bakeshop? Will these fragments of thoughts develop into a story or book? That’s up to the writer. But it is far from a vacation from what an author does. Everyone takes photographs when on vacation of locales, monuments, and famous statues. An author might snap a picture that inspires a story thread, a street sign, a café, or people on the sidewalk. Imagination never sleeps for the creative mind. There is always a spark waiting for discovery. Many, if not all, enjoy the local cuisine of their vacation destination. Rare is there a thought given to the preparation of the food or its origins. Not so for the writer. Tasting a sublime cheese with a delicious wine will take the writer’s mind to a green grassy landscape where cows, sheep, or goats graze. Or the lingering taste of wine caressing the palate could evoke a vision of grape vines flourishing in meticulous rows under a loving sun. These visions could be a backdrop for an intriguing tale of love, rivalry, mystery, or passion. Locals at a vacation destination further feed an author’s imagination. A couple share a park bench. Are they old? Young? Seem happy? Indifferent? Or having a disagreement? Again, more fodder for the writer. Seeds of a plot are planted. All aspects of a vacation are quite different for those who create. We are a different breed, and yet the same in basic needs. So, when you see someone studying a painting, people or a building, you just might be observing the subtle workings of an author. We wear no signs or placards but merely go about out musings in an unobtrusive manner. Raised in suburbs of NYC, Cynthia longed to become a writer. Life’s circumstances put her dream on hold for most of her life. In 2006 she ventured to write her first novel. Front Row Center, is being adapted to screen. A script is in development by her and known Hollywood screenwriter, producer, director, Scott C Brown. Cynthia shares, with other authors, the Reader’s Favorite International Award for two short stories, When Midnight Comes, and Characters, which she contributed to the horror anthology The Speed of Dark, compiled by Clayton C Bye, published by Chase Enterprises Publishing. She garnered the Excellence in Writing Award from It Matters Radio for her short story It Ain’t Fittin’. This entry was posted in Non-Fiction, Personal Essay, Writing and tagged Author Cynthia Ainsworthe, Editor-in-Chief: Clayton Bye, Non-Fiction, On Writing on March 11, 2015 by Clayton Bye.